Location. 40° 42.76′ N, 74° 0.365′ W. Marker is in New York, New York, in New York County. Marker can be reached from Centre Street. Touch for map. Marker is in this post office area: New York NY 10007, United States of America. Touch for directions. The marker is at the top landing. (within shouting distance of this marker); New York City Hall (within shouting distance of this marker); Mail Street 1875-1939 (within shouting distance of this marker); First Almshouse (within shouting distance of this marker). Touch for a list and map of all markers in New York. More about this marker. The marker is flat in the landing of the front stairs to the building. 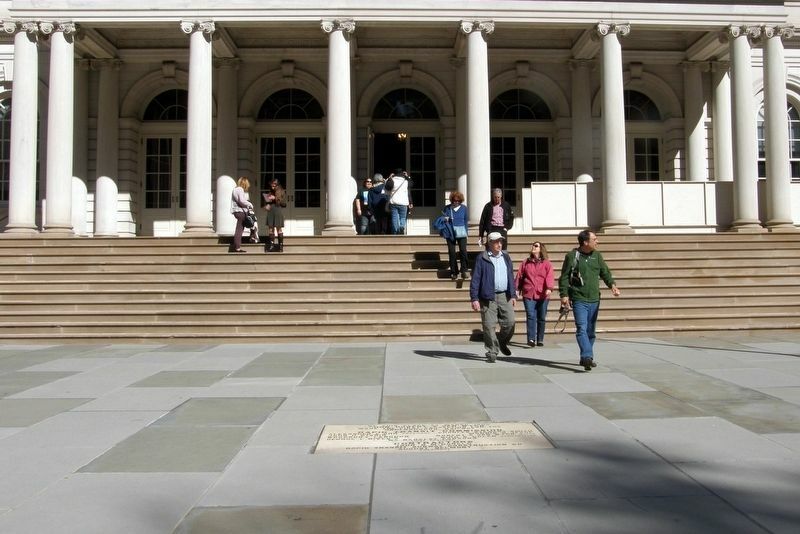 Due to post-9/11 security, it is viewable only during public events like Open House New York. More. 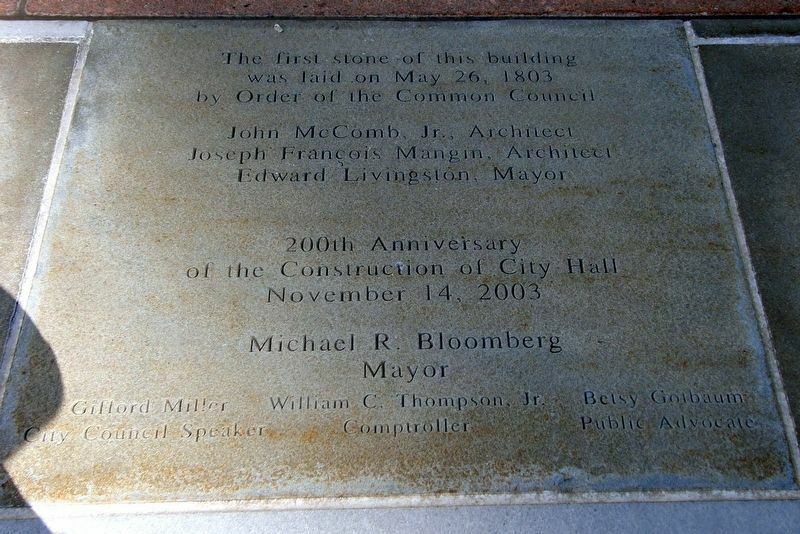 Search the internet for 200th Anniversary of the Construction of City Hall. Credits. This page was last revised on March 1, 2019. 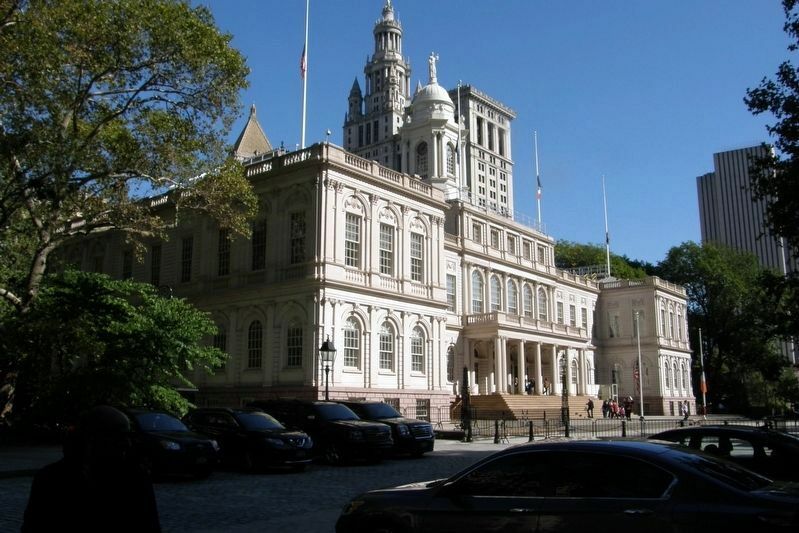 This page originally submitted on March 1, 2019, by Larry Gertner of New York, New York. This page has been viewed 44 times since then. Photos: 1, 2, 3. submitted on March 1, 2019, by Larry Gertner of New York, New York. • Bill Pfingsten was the editor who published this page.